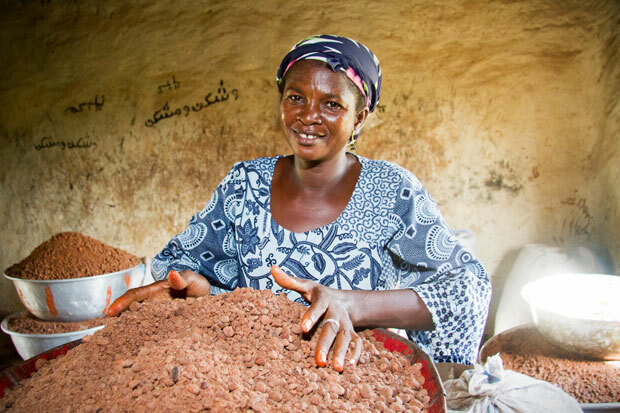 TechnoServe has helped 4,000 rural women to earn higher incomes by collecting and processing shea nuts. Damata Shihadu, a member of the Nyebu Be Yoona cooperative, feeds shea nuts into a depulping machine in order to make shea butter. TechnoServe has helped Damata and more than 4,000 poor rural women in northern Ghana earn more sustainable incomes from shea. We worked with women’s producer and processing groups to improve their technical, business and money management practices, and to find financing and new market opportunities. With our assistance, the women have increased their productivity and more than tripled their incomes, giving them money to feed their families and send their children to school.